Battlefield 4 wants you to break it. Demolition has been, to varying degrees, its distinguishing feature since DICE made Battlefield: Bad Company 2 destructible. In BF4 it takes the form of massive, shatterable centerpieces in each multiplayer map. A concrete dam you can ruin. A dentable radar telescope. A crippled Navy destroyer that, with an encouraging explosive push, can be run aground in Paracel Storm. On Siege of Shanghai, which you may have played during the beta , it's a glass skyscraper that's centered on control point C. Throw enough C4, RPGs, or tank rounds at its four exterior support columns, and the tower will jenga to the ground, leaving a grave of split concrete behind. But over the hours I spent in multiplayer, I stopped caring that I could topple skyscrapers. And by the third or fourth time it happens in your game, you'll probably be shrugging it off too. The sky scrapers that I actually adore in Battlefield 4 are the jets. The sound they make, like other sounds in BF4, is the best sort of distracting. It is a ragged, jagged crackle of bass, like a thunderstorm being dragged against its will. Jets are immersion emitters, and whenever one swoops through my field of view I feel it on my skin. This continues to be one of Battlefield's enjoyable traits--the individual violence of 64 people generates immersion for everyone. The big, disaster-movie moments of destruction in BF4 are initially novel, but it's the incidental, aggregate moments of wonder that hold up over time. The blur of wind as you basejump off a rooftop. The growl of an ATV as its tires chew grass. The ringing in your ears when a MLRS rocket detonates nearby. The carriage-return clink of an M40A5 bolt shifting back into place. DICE is the Mozart of war, and its mastery over sound continues to define Battlefield's moment-to-moment richness. Hainan Resort is a playground for Battlefield's multi-role combat. But this is nothing new, and neither is a lot of Battlefield 4. Two years removed from BF3, DICE hasn't made fundamental changes to the feel or format. It's still a 64-player, infantry-driven FPS fought on expansive outdoor maps, with a garage of air, ground, and sea vehicles waiting to taxi you between capture points. The weapon roster is fairly intact, with assault rifles such as the M16A4 and AEK-971, carbines such as the SG553 and G36C, SMGs such as the UMP and P90, shotguns such as the M1014 and the SPAS-12, and sniper rifles including the SV-98 and M40A5 all returning from BF3 essentially untouched. I understand why DICE wouldn't deviate from its design--why change weapon handling that continues to rest comfortably between accessible and nuanced? Why throw out modes that already suit the maps and mechanics? Even so, you'll want to factor in that abundant familiarity if you tired of BF3 quickly--BF4 will probably age faster than its predecessor did. Keeping some of that sameness at bay are features like Commander Mode , a strategic role returning from BF2142 that one player per team can occupy instead of fighting. Commanders view the match omnisciently through a fullscreen map, issuing attack and defend orders while phoning in what are essentially killstreaks as they're earned by squads. These “commander assets” are pretty powerful in the right hands, as they include everything from air-dropping ammo and health, to temporarily spotting all enemy infantry, to summoning an AC-130 gunship that players can spawn into. The latter makes you feel like Zeus; lobbing cannon rounds from on high is a wonderful break from being a pair of boots on the ground and it takes real skill to lead targets while orbiting. I like that these commander abilities aren't so ubiquitous that they create frustration, as killstreaks have for me in some iterations of Call of Duty. The commander role has a similar effect as it does in Natural Selection 2 : as a grunt, it's liberating to have most of the top-level strategic thinking offloaded. For BF groups and clans, it also creates a clear position for a captain, which I love. Considering the way that BF3 slightly de-emphasized teamwork by running VOIP through Battlelog, this is a welcome addition. Of huge help is being able to see teammates' perspectives through a picture-in-picture camera (also available when you're spawning on squad), which removes some of the abstraction of telling your colored triangles how to best kill differently-colored triangles. Siege of Shanghai is a U-shaped fight for a central skyscraper. Helicopters help out by taxiing snipers to rooftops. Outside of this strategic role, there's a new hybrid bomb-planting and capture-point mode that I like. “Obliteration” joins the compact, fast-paced mode Rush and standard, longer-form Conquest and team deathmatch modes as a more meat-grindery back-and-forth that occasionally resembles rugby more than it does Battlefield, but in a good way. Like the armory, the vehicle set is mostly unchanged, save for a neutral MLRS truck that spawns on a few maps. It's a lovely addition, and in smart hands it's a tide-turning asset. Controlling the MLRS gives your team a mobile artillery to knock out hunkered-down defenders or disrupt the advance of vehicles. DICE balances the truck by giving it a limited firing arc, a long ammo-regeneration timer, and by separating the driving and firing positions. BF4's “ Levolution moments,” as EA clumsily termed them, are presented as BF4's main attraction. As I mentioned, these scripted action movie setpieces don't fundamentally change how you fight, but I actually appreciate that they only gently influence matches. One of the better events in Paracel Storm isn't the wrecked warship that you can run aground, but the way the sky shifts from a clear, tropical postcard to an oily hurricane. The ocean gets choppy, making movement on jetskis and boats more of a chore. Tonal shifts like this are hard to find in modern multiplayer games. At the less enjoyable, less ambitious end of the Levolution spectrum is Golmud Railway, a vehicle-friendly Chinese plain. The dynamic element here is a small, slow-moving train that happens to be one of the six capture points. This might've been a nice design on paper, but the train is easily intercepted and implemented in a way that has almost no strategic value. A lonely caboose putting along in the middle of a tank war feels out of place. Good and not-good gimmicks aside, the layout and look of BF4's maps is thoroughly great, great enough in a few cases to stand alongside Wake Island and Caspian Border as some of Battlefield's all-time best. Hainan Resort is my favorite of the 10, a bowl-shaped tropical bay overlooked by a hotel. LAVs inevitably stack up in the courtyard at the lip of this resort, generating some excellent cat-and-mouse between armor and engineers while gunboats harass from the shore. Naval combat is more abundant in BF4, expressed in maps like Flood Zone, where you fight on the connected rooftops of apartments that are submerged in 50 feet of swimmable water. And Golmud Railway, while it's slightly a drag in Conquest, is fantastic in Rush, which shrinks the map to a concentrated, satisfying attack-and-defend format--my team had to earn every capture point against defenders who continually had the high ground. All maps also benefit from the increase in squad size from four to five, which does a little to mitigate the long traversal times present in some BF3 maps and modes. FOV is locked in the campaign, meaning that some weapons take up a ton of screen space. The sour exception to the well-designed map pool is Operation Locker, a flat, bottlenecky industrial bunker. If you enjoyed BF3's Operation Métro you'll love it, but it's my belief that Battlefield doesn't play well in compact spaces. Even with just 28 players, an Obliteration round on Locker that I played devolved into an embarrassing 40-minute meat-grinder. Small crowds would gather at meter-wide tunnels, with players blocking each other and dying in piles. Both teams were groaning in text chat up until the end. BF4's campaign is a better appetizer than BF3's dismally generic offering, although it's still a single-player-by-numbers execution. You're a Marine, leading an elite team of tactical experts who all continually need your help to open heavy doors. Amid political strife in China, you're sent to extract a VIP. When it goes predictably awry, it sparks an open conflict between the US and China. It's the same Americans-versus-communists plot pulled from Michael Bay's diary that we've played plenty of in the past few years. The action is straightforward, never deviating from the whack-a-mole game of plunking down pop-up targets in the form of guards, punctuated by cutscenes and the occasional helicopter or tank kill. It's bland, mildly exciting, and so tropey that it includes a level where you lead a prison breakout alongside a Russian inmate, as seen previously in Call of Duty: Black Ops . DICE does gets a good performance out of Michael K. Williams, who played Omar on The Wire. The scope of the BF4 campaign is noticeably narrower than Call of Duty's recent globe-trotting, convoluted single-player stories. On the technical side, it was frustrating that I couldn't widen the campaign's narrow FOV, which is inexplicably locked at around 70. I also found the inclusion of kill counters--points that tally to Battlelog for headshots and combos--in single-player to be strange, and even stranger that I couldn't disable them despite there being a menu option (it only applied to multiplayer). 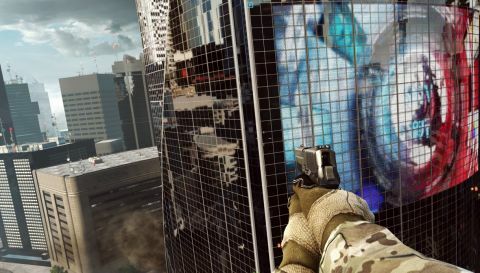 DICE is certainly guilty of taking an “if it ain't broke” attitude to creating BF4, but its modest multiplayer refinements alongside excellent maps are enough to make it one of our favorite current FPSes. A cynic would call BF4 a deluxe map pack in sequel's clothing. If that's your predisposition, know that it's at least a wonderful map pack, one with enough variety, depth, and quality to survive a year of intense play. Note: In reviewing Battlefield 4, we played using the same version of Battlelog present in the final build. However, in order to publish our review at the time that it's most useful to you--at launch--we weren't able to test Battlelog in the context of high usage that is typical of a launch week. We didn't encounter any issues with Battlelog, but you may recall that the system wasn't perfect at launch for Battlefield 3 . We consider it part of our role to suffer through launch issues so you don't have to, and we'll report on any significant issues with Battlelog at launch and throughout Battlefield 4's lifespan.